Let's start with that dreamy fireplace, shall we? Karen Nepacena’s introduction to interiors began with a blog. In the process of renovating their own Joseph Eichler-built home outside of San Francisco, Nepacena and her husband, John Shum, decided to chronicle their mid-century modern remodel online. It wasn’t too long before the designer and MCM enthusiast started getting calls from fellow homeowners who wanted help with their own Eichlers. As the duo began taking on clients, their brief blogging gig turned into a full time business, now called Destination Eichler. Nepacena’s latest project began much like her earlier work. After receiving a call from a man who was already deep into a renovation of his mid-century home (which he had officially decided to makeover after nine years of living in the space), Nepacena was prepared to offer basic guidance on the kitchen design. “I drove up to the house and there was no roof—it was sticks and walls and framing everywhere. It was completely gutted. I had no idea how extensive his project actually was,” she recalls. Although the owner, Tom, and his husband had originally only wanted advice on how to move forward with the kitchen, her involvement in the project quickly escalated from there. Custom built for the original homeowners in 1956, the abode, which sits in Silicon Valley’s Willow Glen neighborhood, boasts all the makings of a true mid-century stunner—an original exterior globe that presides over the front door, large exposed redwood beams, and a sleek, angular roofline. The home is also filled with one-of-a-kind artworks by Tom’s artist husband, who creates his own inspired versions of modern masterpieces. Without changing the overall structure of the space, Nepacena and her client aimed to return the home to its original glory. 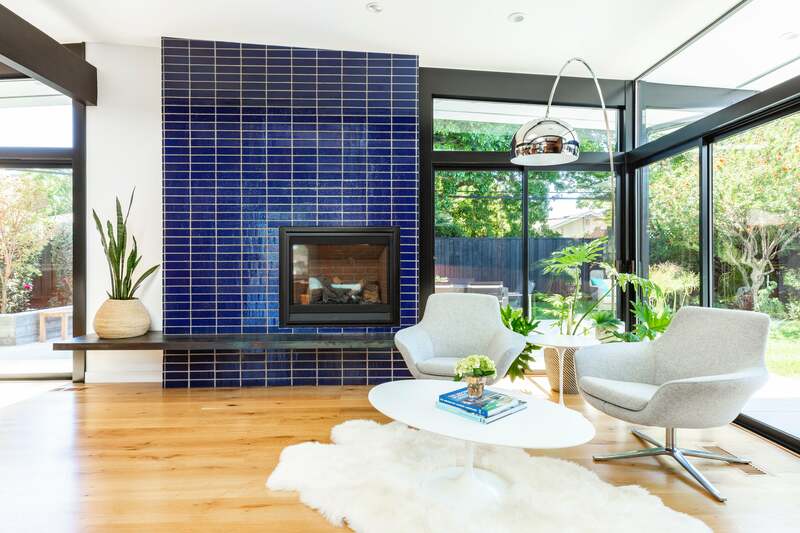 By bringing in materials and furniture of the same era and vein, installing additional glass sliders to the main living room, and swathing the fireplace in groovy blue tiles, the space feels decidedly modern without falling prey to time capsule-y cliches. Ahead, we caught up with Nepacena to learn more about her latest project and her tips for making a character-filled remodel feel fresh. Did you face any major challenges with this renovation? When you embark on an entire home project like this, it becomes bigger than you thought it was going to be. I don’t think it was Tom’s original plan to have a whole new roof put on, but once we started opening things up, it snowballed into a full gut. When you’re working on an old house there are always surprises. You just have to deal with them, mediate them, and move on. Living in California, we have earthquakes so everything has to be retrofitted and meet energy efficient needs—all those little things add up. There are fun parts of a renovation, like picking tile and color, but there are also structural things that have to be taken care of so the house will be stronger going forward. I know that you, personally, have a special love for mid-century homes. How do you play up that modern feel, while still making the space feel new and updated ? The wood paneling that you see in the home now is all new, but it was pretty important to me to bring back elements like wood paneling because in this home, and a lot of other homes from this era, this would have been a material you would have found in a bedroom or all throughout the house. I wasn’t trying to recreate the 50s in the home, but I did definitely want to bring in those rich materials and elements and textures. We could have easily drywalled the master bedroom and painted it a color, but I was pretty certain that the feel of these materials would make the home really special and truer to its roots even though we did modernize it. What do you think are some of the pros and cons of renovating a home with so much architectural character? I personally love the lines of the home’s framework, the angled rooflines, and the post and beam construction. You don’t really see a lot of those elements in new home construction. In Tom’s house, all of those black beams were original, and if they weren’t original, we put in new ones that fit the framework. But any time you want to work on an older home and bring materials back in, it’s not always going to necessarily be the most budget-friendly. Having big walls of glass and beams brought in is going to be more costly. I need to know more about the fireplace. Is this original to the home? That was new actually! Tom knew he wanted indoor/outdoor access throughout that main open area, but he also wanted a fireplace a feature here facing the backyard. We ended up cladding the fireplace with a glazed thin brick from Fireclay Tile. The pattern is very true to mid-century modern, with the bricks straight set and stacked all perfectly. Then I fell in love with that deep blue. We could have made it look like any modern fireplace, but when I saw the sample of that blue I said, ‘You’re going to be able to see this from the moment you step in the front door.’ I wanted it to be bold, but then again, feel like it had roots in the 50s. It was Tom’s awesome idea to do a floating steel bench. I love how you embraced the overall character of the home with the furniture. Where do you like to shop for mid-century-inspired pieces? I find a lot of finds for myself and my clients on Instagram. There are great small shops located across California (and the world) and they collect real pieces for great prices. I’ve built some great relationships with these folks. Also, local estate sales are my go-to for finding pieces that are vintage-inspired (they’re still old and original, just not name-brand) and are a fraction of the cost of ordering a new one. You have to be open to the fact that you might have to get something reupholstered but, to me, sustainability-wise, it’s pretty important to give these pieces new life. The bathrooms are so different, but equally bold in their own right. How did you approach these spaces? I really wanted them to be special and have their own personality but also tied together in some way. The tile for the bathrooms came from Heath Ceramics. One of the reasons I love using Heath is because they were founded in the 50s, so, to me, it’s putting the material right back into the type of home they were originally designed for. For the one with all the diamonds, I chose all the colors based on colorways that I thought were mid-century inspired, but I had the installer mix them all up so it would be a random pattern. Again, I was trying to bring in colors that were reminiscent of design in the 50s—like that chartreuse. That yellow-green is an unusual color you don’t always see now.